The haunting of the Phelps poltergeist in the mid-19th century is regarded as one of the most notorious cases in recent(ish) history. 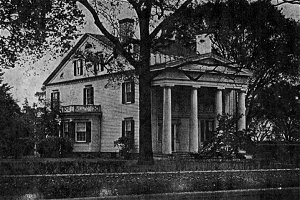 Reverand Dr. Eliakim Phelps lived with his wife and four children (2 girls aged 16 and 6 and 2 boys aged 11 and 3) at the mansion in Stratford, Conneticut. Apparently the Rev may have accidentally been that catalyst for the haunting by opening a seance and receiving various rapping & banging noises in reply to his questions... The disturbances started a few days later when the family returned home from church to find the entire house ransacked, furniture, food & expensive china strewn everywhere. Also they found a "corpse" made from clothing laid out in the middle of the floor. Following this, objects moved about in front of various witnesses, mainly small objects such as cutlery, keys and nails. Furniture also moved around of its own accord and over $100 worth of windows and marble topped tables were smashed. The family even reported the unusual sensation of the house literally "shaking". Even stranger was the appearance of 11 life sized figures made from clothing and cushions. They were displayed in devotional poses with bibles open in front of them, with a centrally placed dwarf-like figure and a final figure suspended above "as though flying through the air". On one occasion the Reverend turned away from his writing desk, only to hear someone writing. He turned back to find someone had scrawled "very nice paper and ink for the devil" onto his papers. The eldest son experience levitation, he was seen to be "carried across the room by invisible hands and gently deposited on the floor". The same boy even awoke in the night twice to find himself outside as though he'd been carried in his sleep! Reverend Phelps said, "I have witnessed these manifestations hundreds of times within the walls of my home, and I know that in hundreds of instances, they took place when there was no visible power by which these motions could have been produced." After eight months of fear and agony, the family moved out of the house, never to return. Apparently the phelps poltergeist did not follow them to their next home, but remained at the Phelps House. After another minor run of activity during the early 1970's the mansion was eventually torn down in 1974.